34Centre for Arthritis and Rheumatic Disease, Dublin Academic Medical Centre, St. Vincent's University Hospital, Dublin, Ireland. Background Since the publication of the European League Against Rheumatism recommendations for the pharmacological treatment of psoriatic arthritis (PsA) in 2012, new evidence and new therapeutic agents have emerged. The objective was to update these recommendations. Methods A systematic literature review was performed regarding pharmacological treatment in PsA. Subsequently, recommendations were formulated based on the evidence and the expert opinion of the 34 Task Force members. Levels of evidence and strengths of recommendations were allocated. Results The updated recommendations comprise 5 overarching principles and 10 recommendations, covering pharmacological therapies for PsA from non-steroidal anti-inflammatory drugs (NSAIDs), to conventional synthetic (csDMARD) and biological (bDMARD) disease-modifying antirheumatic drugs, whatever their mode of action, taking articular and extra-articular manifestations of PsA into account, but focusing on musculoskeletal involvement. The overarching principles address the need for shared decision-making and treatment objectives. The recommendations address csDMARDs as an initial therapy after failure of NSAIDs and local therapy for active disease, followed, if necessary, by a bDMARD or a targeted synthetic DMARD (tsDMARD). The first bDMARD would usually be a tumour necrosis factor (TNF) inhibitor. bDMARDs targeting interleukin (IL)12/23 (ustekinumab) or IL-17 pathways (secukinumab) may be used in patients for whom TNF inhibitors are inappropriate and a tsDMARD such as a phosphodiesterase 4-inhibitor (apremilast) if bDMARDs are inappropriate. If the first bDMARD strategy fails, any other bDMARD or tsDMARD may be used. Conclusions These recommendations provide stakeholders with an updated consensus on the pharmacological treatment of PsA and strategies to reach optimal outcomes in PsA, based on a combination of evidence and expert opinion. The management of psoriatic arthritis (PsA) rests on non-pharmacological and pharmacological measures. The so-called disease-modifying antirheumatic drugs (DMARDs) are commonly characterised by their capacity to reduce or reverse signs and symptoms, disability, impairment of quality of life, inability to work and progression of joint damage and thus can interfere with the entire disease process.1 ,2 There are three major classes of DMARDs, loosely grouped according to different mechanisms of action: conventional synthetic (cs) DMARDs such as methotrexate (MTX), sulfasalazine and leflunomide; biological agents (bDMARDs) and targeted synthetic (ts) DMARDs, such as phosphodiesterase (PDE) inhibitors or JAK-inhibitors such as tofacitinib.3 Tumour necrosis factor inhibitors (TNFis) have been shown to be efficacious in PsA.4 In contrast with rheumatoid arthritis (RA), until recently only TNFis were available as therapeutic agents in PsA, if csDMARDs failed to exhibit efficacy. Recently however, novel therapies with utility in PsA have emerged. PsA is heterogeneous by virtue of its broad phenotypes of musculoskeletal involvement (peripheral arthritis, dactylitis, enthesitis and axial disease), and its spectrum of extra-articular manifestations, especially skin and nails, and other organ involvement.5–7 csDMARDs and bDMARDs have differential effects on the various disease manifestations. With several therapeutic options available and insufficient information on differential efficacy and safety, treatment decisions in clinical practice remain challenging. Therefore, the European League Against Rheumatism (EULAR) developed recommendations for the management of PsA with these drugs in 2011.8 These recommendations were based on two systematic literature reviews (SLRs)4 and focused on indications for the use of and suggestions for differential and strategic employment of csDMARDs and bDMARDs based on treatment targets and disease risk assessment, also making clear that safety aspects and contraindications need to be considered in therapeutic decision-making. As an umbrella organisation of national rheumatological societies, EULAR decided to put its primary emphasis on the musculoskeletal aspects of the disease.8 The EULAR recommendations were based on the evidence available at that time4 and on the results of the discussions and votes by an expert committee. However, as with most recommendations and especially in a rapidly evolving field such as PsA, it was anticipated that the 2012 recommendations would need updating within a few years. Indeed, additional evidence on agents already approved at that time as well as data on new compounds have become available since 2012 (S Ramiro, JS Smolen, S Landewé, et al, Pharmacological treatment of psoriatic arthritis: a systematic literature review for the 2015 update of the EULAR Recommendations for the management of psoriatic arthritis. Submitted to ARD 2015).9 Moreover, new trials have addressed therapeutic strategies10 and treat-to-target recommendations have been developed for PsA since the publication of the EULAR PsA management recommendations.11 ,12 All these developments prompted us to update the recommendations for the management of PsA with non-topical pharmacological therapies. The EULAR standardised operating procedures were applied.13 In June 2014, a Steering Group consisting of seven rheumatologists, one fellow, one patient research partner and one health professional defined the questions that were to be addressed through an SLR. The SLR was performed between June 2014 and January 2015 and is published as an accompanying paper.14 In parallel, a general review of treatment strategies, prognostic factors and comorbidities was performed. In January 2015, the Steering Group as well as the Task Force met to discuss the results of the literature review, aiming at aggregating the available information on disease management in PsA into practical recommendations. The Task Force consisted of 34 persons from 14 European countries: 27 rheumatologists, 3 people affected with PsA, 2 health professionals, 1 dermatologist and 1 rheumatology fellow. This inclusive approach aimed at obtaining broad consensus and applicability of the recommendations. After the final meeting, an anonymised email-based voting on the level of agreement was performed, using a 0–10 scale with a vote of 0 meaning total disagreement with a particular recommendation and 10 meaning total agreement with it. The means and SDs of scores from the whole group were calculated. The recommendations are targeted at all appropriate stakeholders: (A) first, physicians, aiming particularly at rheumatologists, but also other physicians involved in the care of people with PsA (irrespective of clinical presentation), including general practitioners, dermatologists and other specialists; (B) people with PsA who can use these recommendations for information on current therapies, treatment strategies and opportunities; and (C) other stakeholders which include officials in governments, social security agencies and reimbursement agencies as well as hospital managers. The Task Force designated some principles regarding the care of patients with PsA of such generic nature as to be ‘overarching’ (table 1). The first and third overarching principles remain unchanged compared with 2012. Of note, an optimal management of patients with PsA also includes non-pharmacological strategies with patient education and regular exercising. In the second overarching principle, the ‘shared decision’ with the patient, which refers to the necessity to discuss and record treatment aims, management plans and reasons for the recommended approaches with the patient, was expanded by adding ‘considering efficacy, safety and costs’. All these aspects, including costs, need to be taken into account when making treatment decisions. Indeed, while rheumatologists and patients cannot be held responsible for costs of therapies, they need to bear in mind that cost considerations are part of evidence-based medicine approaches,17 especially also in the light of the advent of novel targeted therapies and biosimilars (see below). In the fourth overarching principle, the reference to the treatment target as remission has been deleted, since it is now dealt with in Recommendation 1, but the necessity to abrogate inflammation, which may be seen as a surrogate wording for the term remission, is still clearly stated. Beyond the overarching principles, the process led to 10 recommendations on drug management and treatment strategies, presented in table 1. Table 1 also provides the category of evidence, grade of recommendation and level of agreement for each of the bullet points.16 These recommendations also serve as the basis for the algorithm provided in figure 1. The EULAR 2015 algorithm for treatment of PsA with pharmacological non-topical treatments. bDMARD, biological DMARD; csDMARDs, conventional synthetic DMARD; DMARD, disease-modifying antirheumatic drug; EULAR, European League Against Rheumatism; IL, interleukin; MTX, methotrexate; PsA, psoriatic arthritis; TNFi, tumour necrosis factor inhibitor; tsDMARD, targeted synthetic DMARD. Importantly, the table and the figure synthesise the rationale behind the recommendations in an abbreviated way that may not fully reflect all important aspects. Therefore the accompanying text, presented below, has to be regarded as integral to the recommendations; the multiple facets are contained within the text and not necessarily within the bullet points in the table let alone the algorithm. Furthermore, in all cases the balance between efficacy and safety must be taken into account for an individual patient. Treatment should be aimed at reaching the target of remission or, alternatively, minimal/low disease activity, by regular monitoring and appropriate adjustment of therapy. This recommendation is new and comprises previous overarching principle E and Recommendation 2, but also elements of previous overarching principle D.8 Targeting an optimal outcome by adjusting treatment in the context of regular disease activity monitoring was deemed so important, that this recommendation was placed as number 1, especially given its general strategic nature. In RA, attaining a state of remission or low disease activity leads to better structural and functional outcomes than allowing moderate, let alone high, disease activity.20 ,21 In PsA, there exist few data regarding natural history, treatment objectives and remission.11 ,22–25 However since in PsA inflammation is related to long-term outcomes of joint involvement,26–30 this recommendation states that the objective in patients with PsA is remission or if remission cannot be achieved, a low or minimal disease activity state. Remission is defined here as the absence of clinical and laboratory evidence of significant inflammatory disease activity.11 In addition to absence of inflammation in the joints, absence of enthesitis and dactylitis are also important. It should be noted that this remission of inflammation may not equate to complete absence of all symptoms for many patients. Indeed, recent work in PsA demonstrated that the impact of the disease on quality of life is related to pain, skin problems and functional disability, and fatigue, as well as emotional and social aspects of impact.31 Some of these aspects of impact may be less accessible to pharmacological therapies of PsA, thus leading to a ‘residual’ impact in the absence of inflammation. Definitions of remission and acceptable residual disease activity levels in PsA, its predictors and its relationship with long-term outcomes are still a part of the research agenda and more thorough assessment of prognostic markers of severity (related to risk of progressive disease, structural damage, physical disability and quality of life) must still be addressed. This recommendation also addresses monitoring and the principle of ‘treating to target’ and tight control which have recently been expanded to PsA and updated for RA.11 ,12 ,20 Because of the lack of data regarding the best interval for patient monitoring, the recommendation states ‘regular monitoring’, but we suggest in usual care patients with active disease should be seen between monthly to every 3 months. Similarly, treatment should be adjusted ‘appropriately’: more data regarding monitoring and treatment adaptation are needed in PsA. The only randomised trial addressing specifically a tight control approach in PsA is the recently published TICOPA trial.10 ,44 In this trial, patients with active PsA randomised to the tight control arm had a treatment escalation starting with csDMARDs up to bDMARDs, if the predefined target of minimal disease activity was not reached: the group with tight control had more favourable outcomes. In clinical practice, although such measures are imperfect, it can be suggested to use composite measures focusing on joint involvement and thus including joint counts, such as the Disease Activity Score or the Simplified Disease Activity Index or the Clinical Disease Activity Index (all originally developed for RA);50 the Composite Psoriatic Disease Activity Index;51 the DAPSA;52 or the Psoriatic ArthritiS Disease Activity Score.38 ,53 These scores have been shown to exhibit partly different discriminative abilities.37 However, further work is needed, especially since it is not clear if using a composite measures across disease tissues which may (indeed appear to) have differential therapeutic responses is appropriate. In patients with PsA, non-steroidal anti-inflammatory drugs (NSAIDs) may be used to relieve musculoskeletal signs and symptoms. This recommendation remains unchanged. NSAIDs have been shown to be efficacious on joint symptoms and especially patients with mild joint disease may benefit from NSAIDs, though there is no demonstrated efficacy on skin lesions and risks and contraindications need to be considered. However, a benefit from NSAIDs should be seen within a few weeks and NSAIDs should not be the only therapy above 3 months if patients have active disease as defined in Recommendation 3. In patients with peripheral arthritis, particularly in those with many swollen joints, structural damage in the presence of inflammation, high erythrocyte sedimentation rate/C reactive protein and/or clinically relevant extra-articular manifestations, csDMARDs should be considered at an early stage, with MTX preferred in those with relevant skin involvement. This recommendation combines items 2 and 3 of the 2012 recommendations. However, in 2012 the term ‘active disease’ was used, whereas here it was replaced by ‘peripheral arthritis’ since this is more precise (‘active disease‘ also meaning potentially active skin disease). As in 2012, the experts considered that patients with peripheral arthritis and poor prognosis should be promptly started on csDMARDs, and also with milder disease if arthritis persisted despite NSAID therapy and despite glucocorticoid injections if indicated. Peripheral arthritis in this context is defined globally as one or more tender and swollen joints. The natural history of PsA is variable and not well known given the lack of large, long-term cohorts;54 thus prognostic factors are still part of the research agenda in PsA. Poor prognostic factors, as agreed upon by the Task Force, are a high number of actively involved joints, either tender or swollen (defined as five or more); radiographic damage (joint destruction), in particular if there is also inflammation; elevated acute phase reactants (ie, any value above the upper limit of normal as serological indication of inflammation); and extra-articular manifestations, in particular dactylitis.26 ,28 ,55–58 The presence of any one factor is sufficient to recommend early csDMARD therapy, but usually more than one will be present in patients with bad prognosis. The time that can elapse without structural or functional consequence before a csDMARD is started in the presence of active peripheral PsA is unclear. The phrasing ‘at an early stage’ implies starting treatment within a maximum of 3 months if the PsA is active (in particular with active synovitis), particularly in the presence of the bad prognostic markers mentioned above. There are several recently published studies showing that a prolonged delay before diagnosis and/or before starting a csDMARD is associated with less favourable outcomes.59–63 These studies encourage earlier treatment commencement—the question of a ‘window of opportunity’ in PsA still constitutes an important part of the research agenda. In patients with clinically ‘relevant’ psoriasis, MTX is specifically mentioned as the preferred option, given its demonstrated efficacy on skin involvement.68 Although this recommendation does not refer to composite skin indices such as the PASI (which are widely used in trials, but not by rheumatologists in clinical practice), the present criteria for ‘clinically relevant’ skin psoriasis would correspond, in dermatological terms, to moderate to severe psoriasis, defined as a body surface area involvement >10%, or more limited psoriasis leading to significant impact on quality of life (eg, face/hand/genital involvement). Local injections of glucocorticoids should be considered as adjunctive therapy in PsA; systemic glucocorticoids may be used with caution at the lowest effective dose. In patients with peripheral arthritis and an inadequate response to at least one csDMARD, therapy with a bDMARD, usually a TNFi, should be commenced. The meaning of this recommendation remained essentially unchanged though the terminology has been updated and the sole reference to TNFis in 2012 has been expanded to bDMARDs in general, but with a primary focus on TNFi. In contrast to 2012, more biologicals have shown efficacy in PsA, and some have either been approved or are under consideration for approval; this will be dealt with in subsequent recommendations. In patients with peripheral arthritis in whom a csDMARD (usually MTX because of its effects on joints and skin, but also leflunomide, sulfasalazine or others, see above) is not efficacious (ie, the treatment target of at least low disease activity has not been reached) even though the treatment has been taken for an appropriate length of time (usually 3–6 months), a bDMARD can be considered. Treatment escalation is relevant if the disease is active, that is, if there is evidence of active arthritis in terms of swollen joints and/or at least moderate disease activity by a composite disease activity measure. In the 2012 recommendations, the exceptional use of TNFis in ‘a very active patient naïve of disease-modifying treatment’ had been addressed in Recommendation 8. This has been deleted in the current recommendations given the lack of data and the lack of consensus and, thus, no longer constitutes a recommendation. In patients with peripheral arthritis and an inadequate response to at least one csDMARD, in whom TNFis are not appropriate, bDMARDs targeting interleukin (IL) 12/23 or IL-17 pathways may be considered. 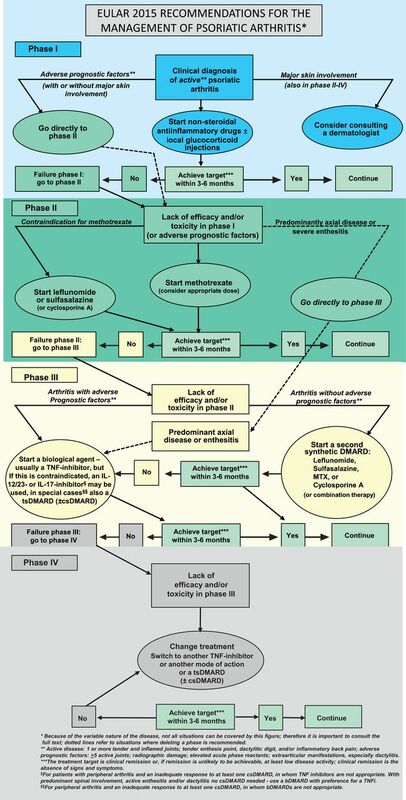 The Task Force felt that the place of these new drugs and in particular of the licensed drugs ustekinumab (for psoriasis and PsA) and secukinumab (at the time of the Task Force meeting licensed for psoriasis, not PsA, but with efficacy demonstrated in PsA phase 3 trials) in the treatment algorithm in 2015 should be after an inadequate response to at least one csDMARD (this means: as second-line DMARD). However, it should be kept in mind that both agents have shown less efficacy numerically in patients who had previously received TNFi compared with those who had only failed csDMARDs (see Recommendation 10); this reduced responsiveness is also observed with sequential TNFi use. While the safety profiles of these new agents are not unfavourable, long-term safety data are needed to fully appreciate their benefit:risk profile. Therefore, in light of the efficacy/safety profile of these drugs, the Task Force felt that these new drugs should usually be recommended for patients in whom TNFis may not be appropriate. No particular sequence was recommended between these two new bDMARDs. Further, it is currently not possible to recommend the continuation of a csDMARD with the new bDMARDs, given the lack of evidence for an added benefit from co-medication in the randomised controlled trials (in post hoc analyses), although it is not needed to discontinue csDMARDs and not at all an error to continue them (Ramiro S et al, Submitted to ARD 2015). Elucidation of this question constitutes part of the research agenda. Patients in whom TNFis may not be appropriate include, for example, patients with comorbidities or those with a history of infections or patients who prefer not to be treated with a TNFi. In patients with peripheral arthritis and an inadequate response to at least one csDMARD, in whom bDMARDs are not appropriate, a tsDMARD, such as a PDE4-inhibitor, may be considered. Apremilast is a tsDMARD acting as a PDE4-inhibitor and has been demonstrated to be efficacious in PsA (Ramiro S et al, Submitted to ARD 2015). The SLR performed for the current task found a moderate efficacy of apremilast on joints, skin and entheses in PsA.91–93 Thus, apremilast is a new drug, which will expand the pharmacopoeia in PsA. Given the moderate effect size of apremilast on most outcomes in PsA, the Task Force discussed at length the position of this drug. Like all agents, the relationship between benefit, risk and costs has to be considered. Taking into account apremilast's relatively low efficacy, not insignificant costs, the lack of structural data and studies comparing it with MTX, other csDMARDs or bDMARDs, and the good overall safety profile, we suggest the place for this drug should at this time in most cases be limited to patients who failed to reach the treatment target on csDMARDs and for whom bDMARDs may not be appropriate. This would include, for example, patients with comorbidities or a history of infections contraindicating any bDMARD. Such a recommendation cannot be considered as based mainly on evidence, as this use was not studied specifically in the large apremilast phase 3 programme, which included mostly patients who were naive to bDMARDs. Thus in some cases apremilast can also be considered earlier in the algorithm, perhaps for patients without markers of severe prognosis or those who explicitly do not wish to receive a parenteral medication; this would however be at the discretion of the physician, as the group did not reach consensus on such a situation. This recommendation received the lowest level of agreement among all bullet points, reflecting the diversity of opinions. In patients with active enthesitis and/or dactylitis and insufficient response to NSAIDs or local glucocorticoid injections, therapy with a bDMARD should be considered, which according to current practice is a TNFi. This recommendation deals with the subgroup of patients with predominant enthesitis/dactylitis. In this patient population, no data-driven definition of ‘active’ disease (relative to enthesitis/dactylitis) exists and the Task Force considered at least one active localisation as active disease, taking into account quality of life consequences as most relevant in these patients. In these patients, after failure of local or non-specific anti-inflammatory therapy, bDMARDs may be applied even if no csDMARDs have been tried, since the latter have not been proven efficacious in treating these aspects of PsA, especially enthesitis.94 ,95 The experts felt the data did not allow a definitive primary choice between a TNFi or bDMARDs targeting IL-12/23 or IL-17 pathways, since there are no head-to-head comparisons and based on the available data all these agents appear to have similar efficacy on enthesitis and dactylitis. Comparisons across trials were difficult because different outcome measures are used. However, as stated above, the longest experience exists for TNFis. Thus the recommendation was worded accordingly. This recommendation was in fact reworded during the process of developing the recommendations to be in line with the fact that the evidence base is not different for enthesitis or dactylitis than for arthritis and axial disease. It should be noted that while apremilast has shown some efficacy on enthesitis, the Task Force felt that more data were needed than available at the time of the development of these recommendations. In general, physicians must apply good clinical judgement when faced with dactylitis/enthesitis towards appropriate use of bDMARDs without overusing them. In patients with predominantly axial disease that is active and has insufficient response to NSAIDs, therapy with a bDMARD should be considered, which according to current practice is a TNFi. This recommendation applies to the subgroup of patients with PsA who have predominant and active axial disease. Active disease here is usually defined in reference to a Bath Ankylosing Spondylitis Disease Activity Index above 4 points. In these patients, bDMARDs can be considered even if no csDMARDs have been tried, since csDMARDs have no proven efficacy in axial disease.96 Given the limited data on the efficacy of ustekinumab and the lack of data for secukinumab in patients with PsA with axial involvement, the experts held that TNFis would currently be the first choice of bDMARD in these patients (Ramiro S et al, Submitted to ARD 2015). Indeed, we do not currently have sufficient published data on efficacy of ustekinumab or secukinumab in patients with ankylosing spondylitis, and even less data on those patients with axial disease associated to psoriasis or PsA.97 This is also reflected in the current indication for these drugs (ustekinumab approved for PsA but not for axial spondyloarthritis). Thus, these agents may be useful but are recommended here only as alternatives, especially if TNFis fail or cannot be applied. No data were available to the Task Force on the effects of apremilast on axial disease. In patients who fail to respond adequately to a bDMARD, switching to another bDMARD should be considered, including switching between TNFis. This recommendation is derived from studies indicating a good efficacy of a second TNFi in PsA (Ramiro S et al, Submitted to ARD 2015). There is a lack of direct data of non-TNF inhibiting bDMARDs in such situations, but in randomised controlled trials of ustekinumab and secukinumab many patients (33–60%) had previously been treated with TNFis, although their response rates were somewhat lower than seen in patients who had not previously experienced a bDMARD.84 ,87 ,88 Thus, current therapies with a different molecular target do not appear to be more efficacious than another TNFi in this patient population by indirect judgement of the experts. Switches are possible including for more than one switch and including intraclass or interclass switches (including switches from a bDMARD to a tsDMARD); it appears efficacy of third or fourth bDMARDs might be lower at the population level. As shown in table 1, the levels of evidence were quite high for most of the items, although some are still mainly driven by expert opinion (particularly Recommendations 3 and 4). Interestingly with one exception, all items received a mean level of agreement that exceeded 9 of 10. As in 2012, a research agenda was developed/updated (table 2). The updated recommendations for the pharmacological management of PsA presented here contain 5 overarching principles and 10 recommendations. As would be expected, many of the recommendations have remained largely unchanged compared with those provided in 2012. However, in 2012, patients with PsA had only TNFi available, once csDMARDs had failed, while meanwhile new bDMARDs, a bsDMARD and a tsDMARD have been, or are in the process of being approved for PsA, thus expanding the treatment armament importantly. Moreover, strategic trials had not been previously performed for PsA and this has changed meanwhile. Thus, the updated recommendations propose a new algorithm which integrates all these recent developments that include drugs with novel modes of action as well as novel strategic evidence and new data on already previously addressed agents or principles. These recommendations should provide physicians who treat patients with PsA with a practical approach to prescribing the most appropriate treatments for patients with PsA based on the most recent insights. Beyond physicians, the EULAR recommendations are also aimed at patients with PsA so that they are informed about current treatment goals, strategies and opportunities. Importantly, patient representatives have also participated in the Task Force. It may, however, be useful to reformulate these recommendations into ‘patient-friendly’ wording to enhance their implementation. Moreover, other stakeholders, such a policy makers as well as representatives of hospital management and social security agencies are targeted to gain information on the latest therapeutic developments and approaches in the field. The updated EULAR recommendations are an international document, designed and intended to serve a large array of stakeholders throughout Europe and beyond, although we are aware of the fact that not all agents mentioned here are universally available or accessible. While we are aware that, in parallel, the Group for Research and Assessment of Psoriasis and Psoriatic Arthritis is also updating management recommendations, these recommendations may have a relatively prominent dermatology focus,103 ,104 while we very deliberately aimed and aim at developing recommendations that have a major focus on the musculoskeletal manifestations of PsA, since societies representing rheumatologists, other health professionals working in the field of rheumatology and patients with musculoskeletal disorders form EULAR's constituency. These recommendations reflect the current state of evidence and opinions in the area of PsA pharmacological management. The 5 overarching principles and 10 practical recommendations have a high level of face validity and feasibility, and the development of a scientific agenda will guide future research. However, while many recommendations are based on high levels of evidence, some of them are solely based on expert opinion, implying that the research agenda is extensive and important. In this respect it is important to bear in mind that, despite the evidence of their efficacy from randomised controlled trials, only expert opinion can currently define the place of the new drugs in the treatment algorithm. We are aware that this placement in the algorithm will be a topic of intense discussions in the rheumatology community. Indeed, some will contend that the Task Force has been too proactive and others will argue that it has been too limitative in terms of placement of the new drugs in the therapeutic algorithm or in terms of definitions of the target treatment population. However, the Task Force has very thoroughly considered overall efficacy (none of the new agents is numerically more efficacious than the TNFis), safety (some of the new agents indeed appear safer than TNFis) and costs, as far as comparatively available or known. Importantly, currently long-term experience on efficacy and safety exists for the TNFis, but not the new agents, and it is only such data that can elicit an amendment of these recommendations in the near future. Our aim is certainly to encourage further research and innovation in the field of rheumatic diseases, including accrual of efficacy and particularly safety data of new agents in registries and long-term extension trials. Thus, we feel that the proposed algorithm addresses all relevant issues related to an indirect ‘comparison’ of drugs, namely efficacy, safety, ease of use, costs and long-term experience. It must also be borne in mind that the Task Force presents recommendations, not opposable guidelines, and thus the individual items reflect a majority view of many experts, including patient representatives, but at the same time provides sufficient leeway to the individual physician and national societies to consider a different approach than advocated here—this by no means would be ‘wrong’. However, the very high level of agreement among the Task Force members across almost all recommendations supports their appropriateness and validity. The Task Force was aware that some agents covered here were not yet approved for PsA by the European Medicine Agency at the times of the meeting and manuscript development. However, we based our assessments and decisions on the available and thoroughly evaluated and discussed literature and felt that the recommendations should include them in our aspiration to support physicians when taking treatment decisions now and in the near future. Finally, as has been the case over the last decade, it is to be anticipated that new data on existing or new drugs or therapeutic strategies will emerge over the next few years and that some of the open questions as formulated here may be answered by then. Therefore, we will carefully observe the developments in the field and assume that an amendment of these recommendations may be needed in 2–3 years’ time.
. The Swedish early psoriatic arthritis register—2-year followup: a comparison with early rheumatoid arthritis. J Rheumatol 2008;35:668–73.
. Clinical indicators of progression in psoriatic arthritis: multivariate relative risk model. J Rheumatol 1995;22:675–9.
. Swollen joint count in psoriatic arthritis is associated with progressive radiological damage in hands and feet. Clin Exp Rheumatol 2012;30:45–50.
. Early treatment of psoriatic arthritis is associated with improved patient-reported outcomes: findings from the etanercept PRESTA trial. Clin Exp Rheumatol 2015;33:11–19. , CASPAR Study Group. Treatment of psoriatic arthritis and rheumatoid arthritis with disease modifying drugs—comparison of drugs and adverse reactions. J Rheumatol 2008;35:472–6.
. Is reduction or discontinuation of therapy an acceptable possibility in psoriatic arthritis? Clin Exp Rheumatol 2013;31(4 Suppl 78):S59–62.
. Remission of psoriatic arthritis after etanercept discontinuation: analysis of patients’ clinical characteristics leading to disease relapse. Int J Immunopathol Pharmacol 2013;26:833–8. LG and JSS contributed equally. Contributors All authors have contributed to this work and approved the final version. Funding Supported by EULAR (grant CLI079). Competing interests The authors declare receiving grant support and/or honoraria for consultations and/or for presentations as indicated: LG: Abbvie, Celgene, Chugai, Janssen, MSD, Novartis, Pfizer, Roche, Sanofi-Aventis, UCB; JSS: Amgen, Abbvie, Astra-Zeneca, Astro, BMS, Celgene, Glaxo, ILTOO, Janssen, Merck-Serono, MSD, Novartis-Sandoz, Pfizer, Roche-Chugai, Samsung, UCB; SR: no competing interests; MdW: AbbVie, BMS, Eli-Lilly, Roche; MC: Abbvie, Actelion, BMS, Boehringer, Celgene, Celltrion, Horizon, Mundipharm, Novartis, Pfizer; MD: Abbvie, Lilly, Novartis, Pfizer, UCB; PE: Abbvie, BMS, MSD, Novartis-Sandoz, Pfizer, Roche-Chugai, Samsung, UCB; RL: AbbVie, Ablynx, Amgen, Astra-Zeneca, Bristol Myers Squibb, Celgene, Galapagos, Janssen (formerly Centocor), Glaxo-SmithKline, Novartis, Novo-Nordisk, Merck, Pfizer, Roche, Schering-Plough, TiGenix, UCB, Wyeth. Director of Rheumatology Consultancy BV; SO: AbbVie, Hospira, MSD; DA: Abbvie, BMS, Janssen, MSD, Pfizer, Roche; NB: Abbvie, BMS, Janssen, Pfizer; JB: Abbvie, Amgen, Bayer, BMS, Centocor, Celltrion, Chugai, Hospira, Janssen, MSD, Mundipharma, Novartis, Pfizer, Roche, Sanofi, and UCB; GB: AbbVie, Janssen, MSD, Novartis, Pfizer, UCB; JDC: Abbvie, Boehringer, Celgene, Janssen, MSD, Novartis, Novo-Nordisk, Pfizer, UCB; ND, KP: AbbVie, Amgen, BMS, Egis, Hospira, MSD, Pfizer, Roche, UCB; OF: Abbvie, Pfizer, Celgene, Janssen, UCB, Novartis, BMS, Lilly; EH: AbbVie, UCB; PH: Abbvie, Amgen, BMS, Celgene, Janssen, MSD, Pfizer, Roche; TKK: AbbVie, BMS, Boehringer Ingelheim, Celgene, Celltrion, Eli Lilly, Hospira, Merck-Serono, MSD, Novartis, Orion Pharma, Pfizer, Roche, Sandoz, UCB; RL: Abbvie, Boehringer Ingelheim, Bristol Myers Squibb, Merck, Pfizer, J&J (Janssen), Celgene; TL: Abbvie, Astellas, Amgen, Biogen Idec, CERIES, Celgene, Clinuvel, Galderma, Janssen-Cilag, Lilly, La Roche Posay, MEDA Pharma, Mundipharma, Novartis, Pfizer, Symrise, Sandoz, Wolff; HM-O: Abbvie, Celgene, Janssen, MSD, Novartis, Pfizer, UCB; DM: AbbVie, Amgen, Bristol Myers Squibb, Celgene, Janssen, Novartis, Novo-Nordisk, Merck, Pfizer, Schering-Plough, UCB; IBM: Boehringer Ingelheim, Celgene, Novartis, Janssen, UCB, Abbvie, Pfizer, MSD, Amgen; IO: Abbvie, BMS, Celgene, Hospira, MSD, Mundipharma, Novartis, Pfizer, Roche, UCB; GS: Abbvie, BMS, Boehringer Ingelheim, Celgene, Chugai, Novartis, Pfizer, Roche, UCB; JS: Abbvie, Boehringer-Ingelheim, Janssen, Lilly, Merck, Novartis, Pfizer, UCB; FvdB: AbbVie, BMS, Celgene, Janssen, Merck, Novartis, Pfizer, UCB; DJV: AbbVie, Actelion, BMS, Celgene, Janssen, MSD, Pfizer, Roche, UCB; JW: AbbVie, Ablynx, Astra-Zeneca, BMS, Celgene, Janssen, Novartis, MSD, Pfizer, Roche, UCB; AZ: AbbVie, BMS, Celltrion, Hexal, Hospira, MSD, Pfizer, Roche, Sanofi, UCB; DvdH: AbbVie, Amgen, Astellas, AstraZeneca, Augurex, BMS, Boehringer Ingelheim, Celgene, Centocor, Chugai, Covagen, Daiichi, Eli-Lilly, Galapagos, GSK, Janssen Biologics, Merck, Novartis, Novo-Nordisk, Otsuka, Pfizer, Roche, Sanofi-Aventis, UCB, Vertex. Director of Imaging Rheumatology BV.